Life can be so sudden. Minal Panchal, who was among the victims at the Virginia Tech shootout, was a young girl. I just visited her Orkut profile and in less than half an hour more than 1000 people posted their condolences in her scrapbook. It makes me even sadder when I think that she will not be reading all this ever. On the face of it her Orkut profile looks so normal but at the same time it looks so scary sad. May Minal rest in peace! May GOD give strength to all of us to lead a good life! 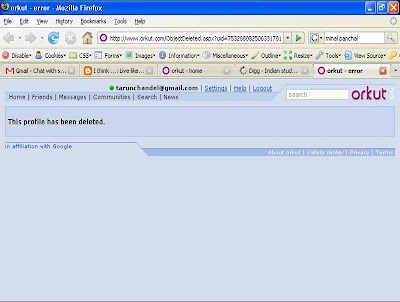 UPDATED on 20th April: Minal's profile from Orkut has been deleted. I tried accessing her Orkut page but I got this error. Minal's profile, deleted from Orkut! I don't know whether Orkut people have removed this profile or someone had access to Minal's account who deleted it. 1. Minal's profile on Orkut. faltu ka sneti ho raha hai tu chandel...Minal is still Alive! Though I fully agree with the message. Your scrap book suddenly becomes your epitah. Ranajan, It's all over the news. In all the leading newspaper as well. Don't spread rumors. It's just wrong the way she lost her chance to live her dreams and it makes me sad as well. Tarun you rightly said that Life can be so sudden. We should live it fully aur jo karna hai aaj hi kar lo, kya pata kal ho na ho! Ranjan I saw her pic in today's DNA, Rizvi college had organized a condolence meet in her memory. Please stop spreading rumor. If you start thinking that it's your last day on earth, all the things which takes most of your time will turn out to be very small and not worth your time. You will spend your time on doing things that are really important to you. It's a beautiful post Tarun and another simple yet powerful way of thinking. That's true Tarun and I agree with Ravi and Reena. life is beautiful and we keep wasting our time and realize it only when there is none left. Ranjan I visited your blog and got to know you are in US. I am sure Minal must not be getting discussed as much there as in India. But that's no reason to spread rumor. I don't think Ranjan is spreading a rumor, he was not well informed. I had a chat with him in the morning and he said that someone had given him a link where Minal had replied in her scrapbook. I tried checking Minal's scrapbook, but her account from Orkut has been deleted. I don't know whether this is done by Orkut or someone had access to Minal's account. I was having a bad day at work, turned to net and randomly came to your post. It made me think that I was worried about all the wrong things and wasting my time on things not worthy of it. Tarun may be then you should delete ranjan's first post.. because it seems kinda disrespectful. Minal may be not be specifically discussed here in US as one person (because the whole thing is a national tragedy)yet we all knew on the first day itself that there were two indians and the names were made public too. I came to know about your blog thru "cooks cottage"
One more beautiful blog. Man u r getting really good with each blog of yours. What you have said is so true. Thats what i try to do everyday. Live life to the fullest. Keep blogging. Tata. Vinita, Reena, Sumit, Rahul and Ranjani thanks for the appreciation. Blogging is a beautiful thing and all of you should also give it a try. "... she must had some dreams, she must had some hang ups, some issues to resolve, some things to say, some places to visit, some people to meet. Just like me, just like you, just like each one of us. All those things gone and no one knows when and how it will be over for us..."
This is so true and is the same case with me. This is a sad post but an inspiring one at the same time ... good that I stumbled upon you blog. Keep up the good work! Thanks Bhargavi for the appreciation.